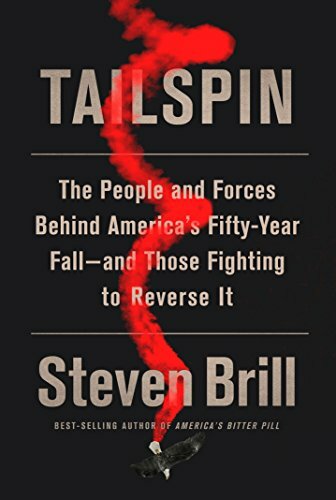 Steven Brill’s Tailspin is an astonishingly shrewd and detailed account of our modern American reality. Here you’ll find explanations for, among other things, how elected officials came to spend 20 or more hours a week calling rich people for money; why it’s now mandatory for workers and customers to sign away their rights to corporations by agreeing to nonnegotiable “terms and conditions;” why pretty much no financier was punished for the global financial crisis; and why our most basic infrastructure is in such abysmal shape that crossing a bridge is a click of Russian roulette. Many of these topics, of course, are familiar; you likely won’t be surprised to learn that money has overrun the government. But Tailspin offers something unique: a meticulous cross-disciplinary history. Over the past 50 years, Brill explains, members of a meritocratic elite have built “moats” around themselves by way of ingenious legal and financial engineering, and those moats now protect corporations and the wealthy from accountability and taxes. Everyone else has been left to suffer the consequences. Each chapter focuses on a different aspect of this central predicament, from the hijacking of the First Amendment to the fate of the working class to the lack of protections for the impoverished. Brill also chooses to devote the end of each chapter to plausible solutions, which makes Tailspin a more enjoyable read than if he had catalogued all the bad news before revealing anything encouraging at all. Thus the most heartening story arrives early, when he describes strategies that are bumping working-class Americans up the economic ladder. Brill showcases an organization that’s teaching low-income students in New York City to write code for web development, after which they land jobs averaging more than $80,000 a year—and have the skills to become entrepreneurs, should they so choose. A key moment of the book comes when Brill asserts that “Americans need to get better at democracy.” Indeed, Tailspin makes clear that the U.S. cannot wait for its meritocratic elite—who have wired the political system for gridlock and the economic system for their narrow gain—to change course. Rather, everyone else will have to figure out how to repair, and fortify, American democracy. As long as most citizens sit on the sidelines, it appears that the problems described in Tailspin will only get worse. By way of encouragement Brill offers the Arab Spring as an example of modern revolution, though he does not acknowledge that that movement mostly failed to bring democratic reforms to the Middle East. It’s clear that Brill aimed to strike a hopeful tone wherever possible, and in some places that feels hollow. Yet perhaps there is cause for optimism. On the day that I finished reading Tailspin, teachers in North Carolina were striking for better funding for their schools and fair pay for themselves, and a dynamite activist called me up to say she’s running for state senate. As Brill makes clear, America has been on a 50-year tailspin—but maybe there’s an upswing ahead.